Our award-winning hotel is located 0.4 miles from Rensselaer Polytechnic Institute (RPI) and at the center of historic downtown Troy, NY. 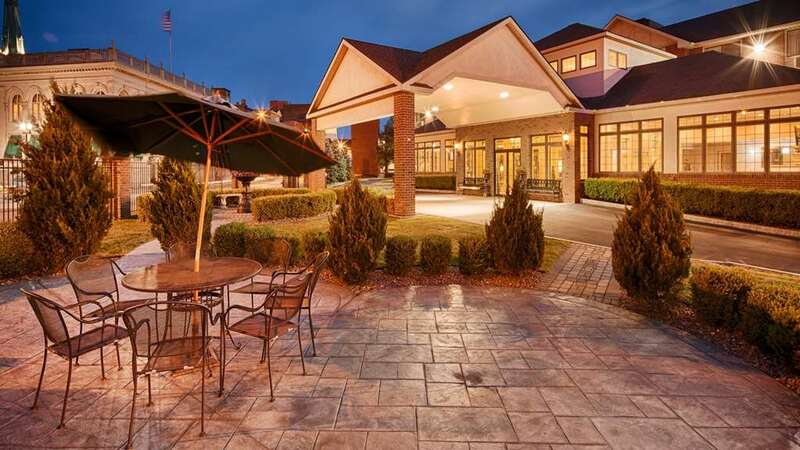 The Best Western Plus Franklin Square Inn Troy/Albany offers comfort and convenience within a short distance of all the major Albany, NY attractions. Troy, NY is where the Hudson River meets the Erie Canal. The one-time shipping center is no longer an industrial powerhouse - but architectural reminders of its glory days remain. Federal-style estates, industrial-era factories, Georgian brownstones, and 20th century bungalows lend a sense of history to leafy neighborhoods and cafe-lined waterfront. Stay at the Best Western Plus Franklin Square Inn Troy/Albany as you visit historic Troy, NY, tour RPI, or attend your next wedding or event at one of our two luxurious ballrooms;the Franklin Plaza and Franklin Terrace. We look forward to having you with us! The Greek House: 0.3 mile(s) from The Greek House, cafe, Greek, open for: lunch, dinner, authentic, fresh and delicious Greek cuisine. Closed Sunday. Defazios Pizzeria: 0.50 mile(s) from Defazios Pizzeria, full service, Italian, open for: lunch, dinner, wood fired pizza and homemade pasta. Whole wheat and gluten free crusts and pastas available. BYOB, cash only. Closed Sunday. River Street Cafe: 0.20 mile(s) from River Street Cafe, full service, American, open for: dinner, upscale Americana cuisine, reservations recommended. Closed Sunday. Sushi King: 0.30 mile(s) from Sushi King, full service, Chinese, open for: lunch, dinner Chinese/Japanese restaurant with a full sushi bar. Free delivery and closed Sunday. Manory's: 0.3 mile(s) from Manory's, full service, American, open for: breakfast, lunch, dinner, diner serving breakfast all day with lunch and dinner. Oldest restaurant in Troy. The Placid Baker: 0.3 mile(s) from The Placid Baker, cafe, American, open for: breakfast, lunch, this bakery utilizes local and organic ingredients. Closed Sunday and Monday. Ali Baba: 3.0 mile(s) from Ali Baba, full service, Mediterranean, open for: lunch, dinner, Mediterranean food and great lavaash bread. Shalimar: 0.30 mile(s) from Shalimar, full service, Indian, open for: lunch, dinner, authentic Pakistani-Indian cuisine. Closed Sunday. Jose Malone's: 0.10 mile(s) from Jose Malone's, full service, Mexican, open for: dinner, Irish Mexican fusion restaurant. Fresh Mexican food and great margaritas. Vegitarian and gluten free available. Closed Sunday and Monday. Red Front: 0.70 mile(s) from Red Front, full service, Italian, open for: lunch, dinner, Italian eatery. Closed Monday and free delivery. Dinosaur Bar-B-Que: Across the street from Dinosaur Bar-B-Que, full service, American, open for: lunch, dinner, excellent selection of house-smoked BBQ and signature sauces. Live music Thursday nights.